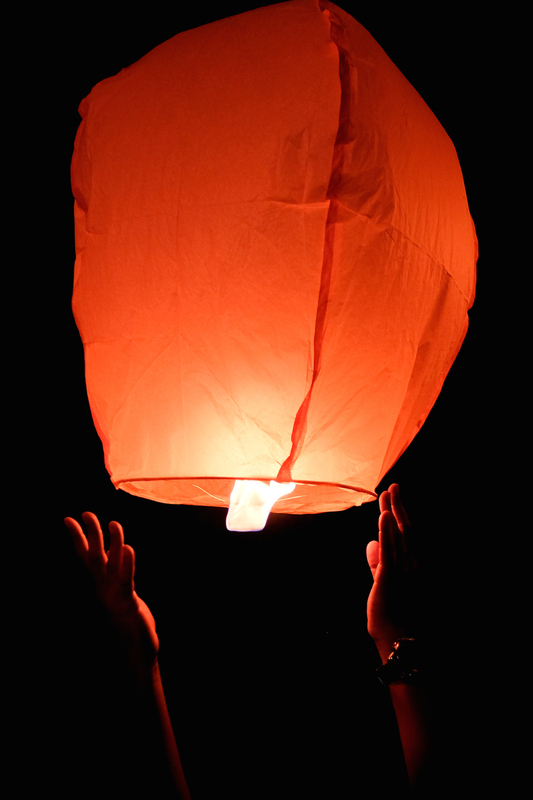 I really liked Colombo, which might surprise a lot of people who have been there. 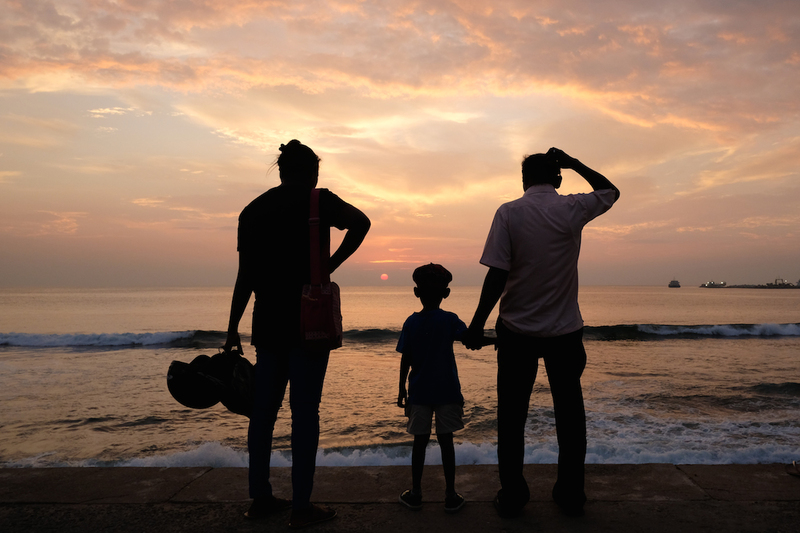 Sri Lanka’s chaotic, sweltering capital has a shortage of things tourists enjoy, like museums, monuments, restaurants and bars. 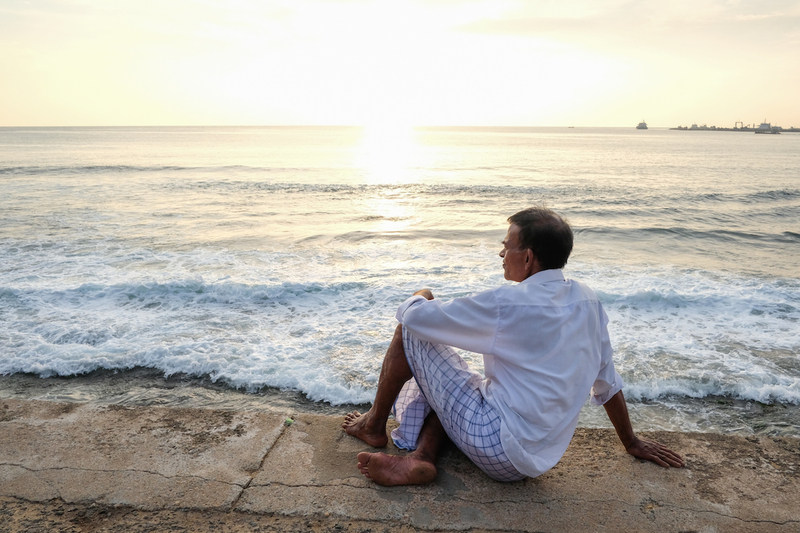 As a result, most visitors to Sri Lanka spend as little time there as possible. Since I became interested in street photography, and since I moved to Bangkok, I now really enjoy visiting the metropolises of southern Asia. There was a time when I’d have shunned places like Yangon, Saigon, and Colombo, but now I really look forward to visiting busy cities. 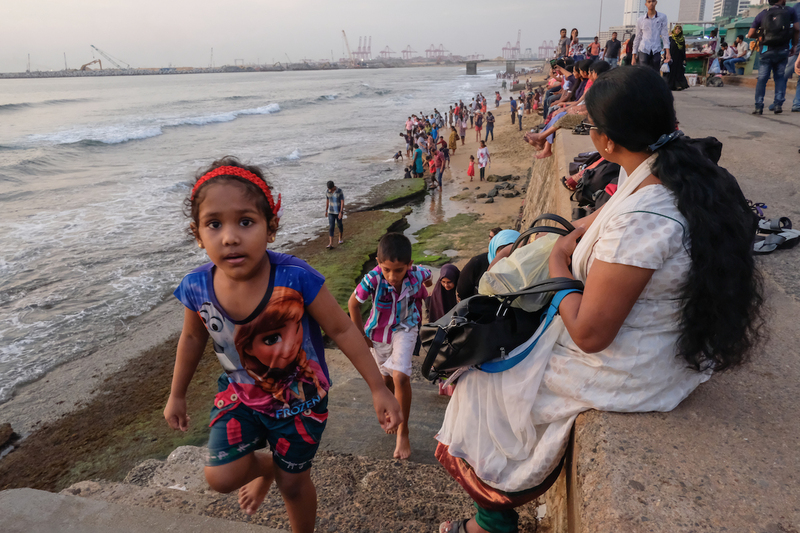 I had two evenings available in the capital for street photography, and spent most of that time at Galle Face Green, a large open space sandwiched between downtown and the Indian Ocean. Galle Face Green is a great spot for photography – families frolic in the sea despite signs warning of poisonous creatures, kids fly kites in the open spaces, vendors serve up exotic street snacks, tourists drink beer from cans wrapped in brown paper sacks, and people of many races and religions walk up and down the sea wall waiting for the sunset. 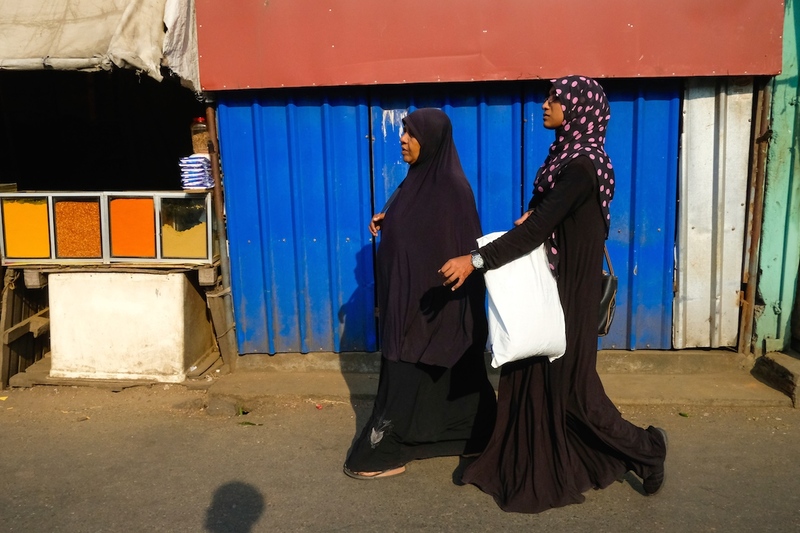 I also went for a walk in the dense, noisy, and hectic streets of Pettah, visiting several mosques and markets. 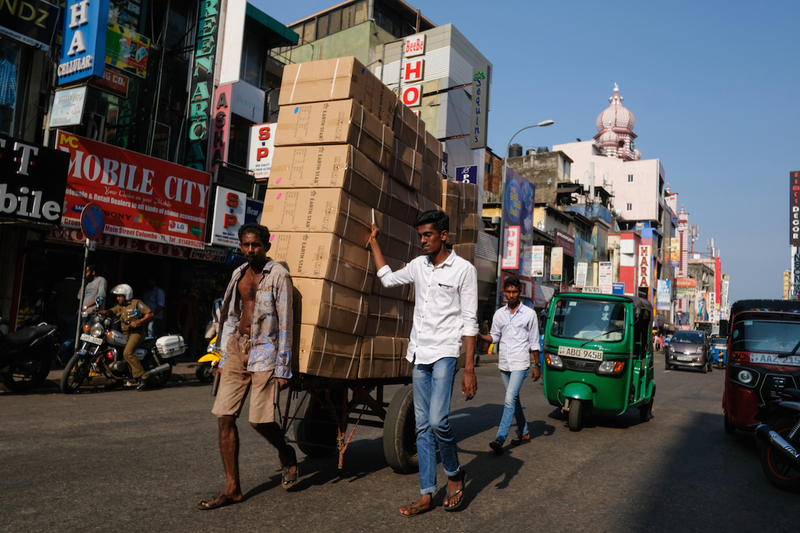 In the narrow streets of Pettah, everything must be loaded from trucks onto two-wheel carts to be delivered to the shops. Even though the guys unloading the trucks and pulling the carts looked hard, I was greeted with smiles, hellos, and requests for photos. Everyone was so friendly there I felt very comfortable taking photos of people who looked very intimidating. I am sure that someday I will make it back to Sri Lanka and when I do I’ll spend several days in the capital city because even though it is hot and chaotic and lacks typical tourist sights, the people, energy and photo opportunities make it a great place to visit. Do you enjoy visiting big cities or do you skip through as quickly as possible? These are a fabulous collection of photos Jeff. We are huge fans of the enormous Pettah market and have grown to really enjoy Colombo. Of course the traffic is maddening, but the more time one spends in Colombo, as you say, like with many big busy cities, the more gems one finds, be it restaurants, temples, museums,..if you can survive the traffic jams you can enjoy what Colombo has to offer. 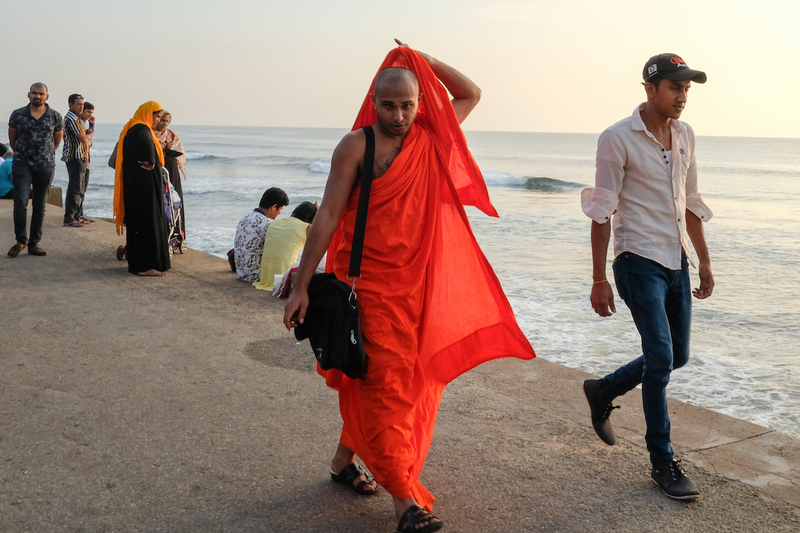 The Galle Face Green is such a fabulous place and I particularly like that you captured a bouquet of photos of all the different religious groups. 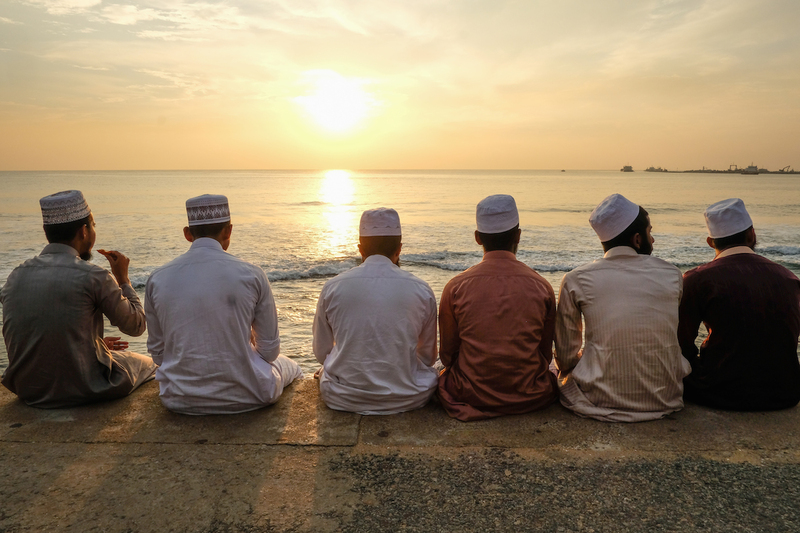 My favorite photo I think is the backs of the Muslim men looking out to sea. Bravo! 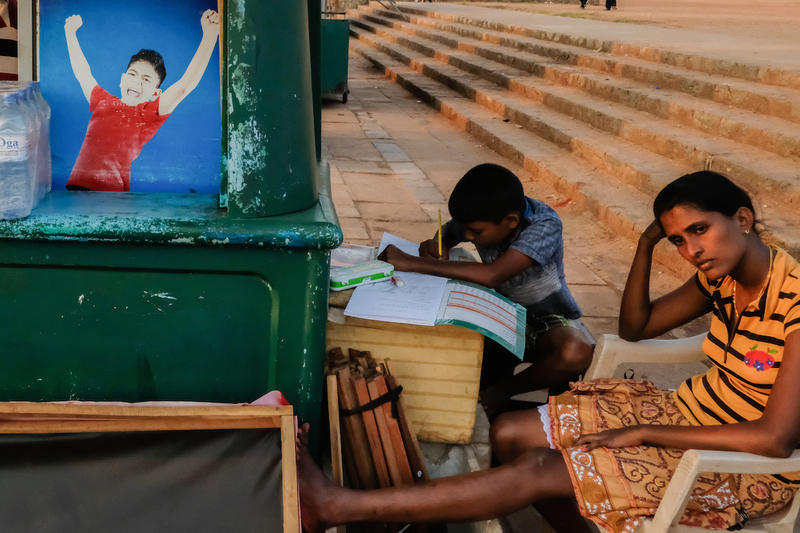 Galle Face Green is one of my favorite places for photography. So much going on there! All over Asia traffic is just terrible. Colombo could use a good metro! We did find tuk tuks to be cheap and hassle free, and we took the city bus a couple of times which was fun. I assume that as more travelers head to Sri Lanka, Colombo will add more and more tourist friendly restaurants, bars and cafes and become more of a destination. Very good collection of photos. I’ve never been to Colombo. But I have the interest to watch shots from these places. Thank you. If you enjoy cities or photography, it is a great place to visit. “There was a time when I’d have shunned places like Yangon, Saigon, and Colombo, but now I really look forward to visiting busy cities.” I feel like this is also what happened to me. For some reason I love exploring big cities much more than I did years ago. Coming from Jakarta I’m often lured by the appeal of an orderly and clean place. But big, chaotic metropolises share one thing in common: the energy. Marvelous photos, Jeff! But if I had to choose, number 5 would have been my favorite. 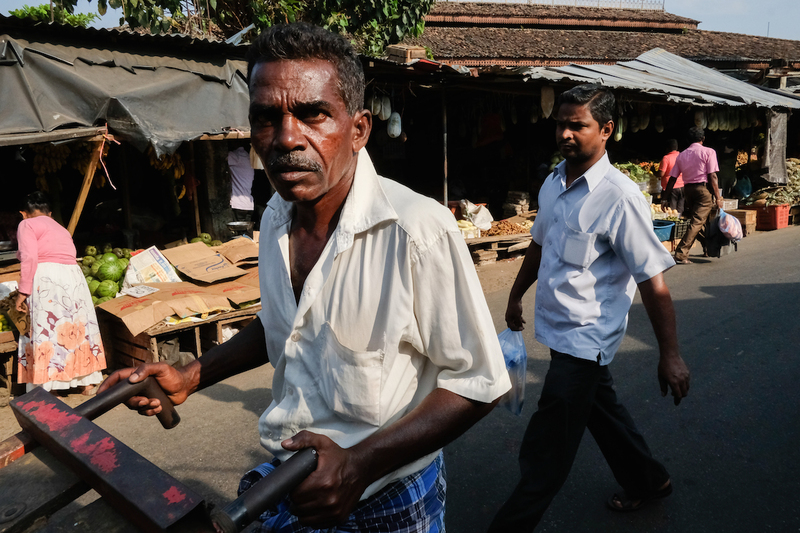 I so enjoyed this visit to Colombo, Jeff, thanks for the descriptions and fantastic photos. I enjoyed each photo immensely. The ones that grabbed me most were the mother with her son doing homework (the look on her face); and the men with their cart, their load is stacked so very high. Thank you for the comments. 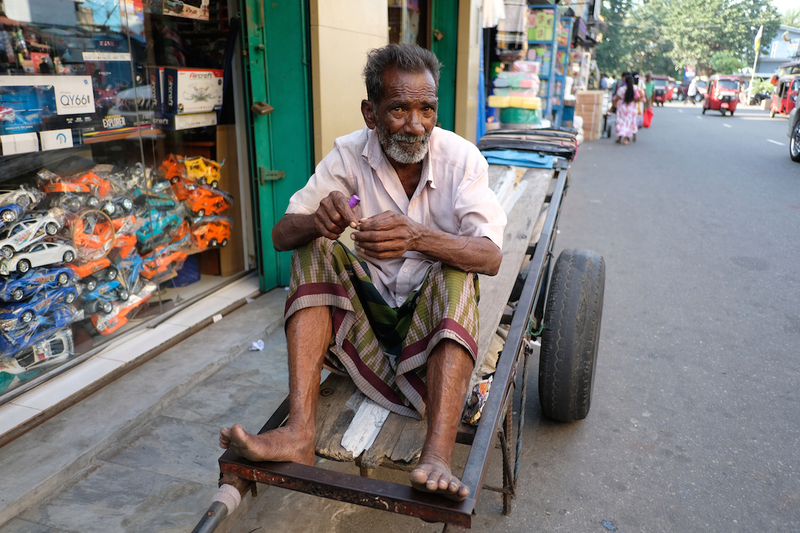 I liked the woman too, I just wish I’d have moved the camera to the right a little 🙂 All over the busy parts of Pettah, guys load up carts to move cargo. 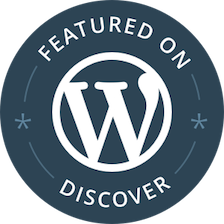 It is pretty crazy to see it. Some of those guys are strong and tough. I have a love/hate relationship with big chaotic cities. I’m drawn to them because of their vibrance and craziness— so different from my quiet, über-orderly existence in West Vancouver. At the same time, I find it exhausting and I need to “acclimatize” to places like Bangkok and Cairo. When I give them time, they tend to grow on me.Your Colombo photos are really engaging. I love the expressions on the faces of the ladies in your first photo, and the man on the cart. The row of guys at sunset is special too! I too feel the need to acclimatize. Even when I go downtown in Bangkok I need to take a breath and get my bearings. Of course, Cairo and Bangkok are two of the more hectic cities in the world. Thanks for the feedback on the photos! I’ve come to really enjoy big cities, Bangkok especially. When I was in Sri Lanka I only spent one night in Colombo and didn’t explore at all. I really regretted that after the trip was over. People in Sri Lanka are so friendly and I know I missed out on seeing a lot of culture and scenes of everyday life. But I know I’ll go back someday — Sri Lanka is a favorite. I expected to find a lot of hassles in Colombo, thinking it would be like India. Colombo, and all of Sri Lanka, is really easy to visit. I am sure when you go back you’ll enjoy it! Like many other commenters, I sometimes love and sometimes hate big cities. You’ve certainly humanized this one, and that’s the key to loving these metropolises, I am convinced. Agreed. Finding the smaller, cozier parts of big cities is the key. We stayed in a quiet part of Colombo the first time in a residential area, and the second time stayed right by the Old Dutch Hospital which is one of the only places with lots of restaurants and bars. Both places reduced the city to a manageable scale. It was overwhelming walking around other districts that were big, noisy and chaotic, but also a lot of fun! I too love the big cities. There’s always so much to see on the streets and I’d much rather be there photographing the people than in a museum, tho sometimes that’s worthwhile too. Your post reminded me of Delhi which I absolutely loved. Wonderful photographs. My favourites are the last two. Ah Delhi. I need to get back there again. We are headed to Kolkata in a month though! Have you been to Kolkata yet? No, and not likely too since I doubt I’ll ever get Don back to India again lol. These are great! I especially love the smiles in the first picture. Thank you. I like those girls too. It was a genuine moment. Your post inspires me to give street photography a shot. Such a range of feelings conveyed in the images. It is a lot of fun. It is really difficult, I must admit. I’ve been doing it for a couple of years and have a lot to learn! I love big cities and I despise big cities, sometimes within the same minute. You have an extraordinary collection here Jeff. My top choice, not that you asked, is the little girl with the beach stretching out behind her. I am wondering when you are getting face shots are you asking permission or just taking them and hoping for the best? I almost never ask permission. For that particular photo, there were hundreds of people out and about in the park, many with cameras, and I was out in the open taking photos. I was not hiding anything, and I was smiling at people after I took the shots. Especially in Asia, almost no one takes offense or is suspicious of such behavior. 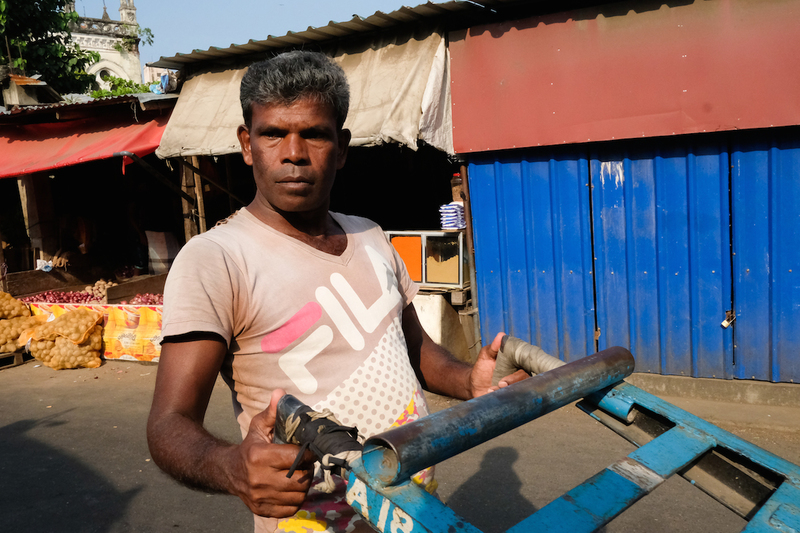 Sri Lanka is very camera friendly country, and I felt comfortable taking candid photos in markets, at the docks and in the streets without concern. Certainly interesting how different countries feel about cameras. In Peru the opposite is the case.